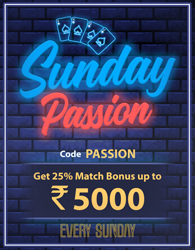 Rummy Passion offers three different popular Indian online rummy variations, i.e., Points Rummy, Pool Rummy and Deals Rummy. All 13 cards rummy variations have the same basic rule, i.e., make required sequences and or sets before your opponent and finish the game. Play Rummy Online or on mobile to win cash. In 13 card Points Rummy, points are defined for each card and these carry a fixed rupee value. The winner is declared at the end of each deal. The winning player has the least points at the end of the game. This is the most popular variant of Indian Rummy as the game moves very fast. Each game is a single deal. A pre determined value is assigned to points. A winning hand must consist of one pure sequence (without joker) and one other sequence (with or without joker). The winning player gets 0 points and all others get points for cards that they have not been able to meld into valid sequences or sets. 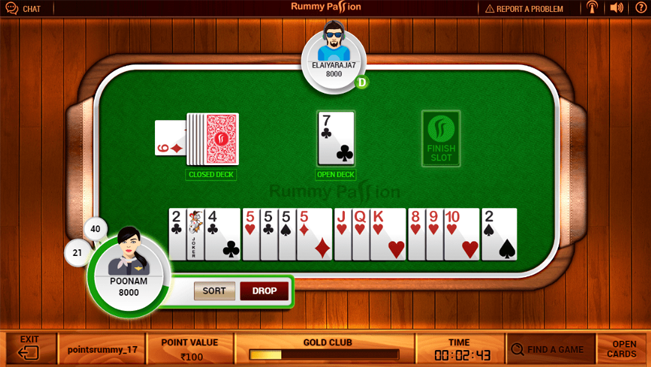 To learn more on Rummy rules and strategies, check out How To Play Rummy Online? All players at a table combine or ‘pool in’ money as they take their seats at a table to play a game. The goal is to accumulate zero points as points carry negative value. When the deal or game is over, the player with zero points is the winner. The loosing players accumulate points based on the cards they hold in their hand. Players whose points add up to (101 or 201) which are maximum points are eliminated. Ultimately all players get eliminated, except one, and that player is declared the winner. The player with the lowest score at the end of all games is declared a winner. All other cards could be melded into sets of 3 cards or 4 cards. A player can also make straight sequences with the remaining cards. At the end of each deal that is after a player declares, points are calculated. As soon as any player reaches a total of 101 or 201 points (based on the type of game that is selected), they are out of the game. A player who has previously left the game, can come back into the game in case no other player in that particular game has more than 79 points. We carry this format of Rummy in which all players at a table play each hand with the same number of chips and the number of deals is also fixed. The player who wins all the chips at the end of each deal is the winner of that deal. At the end of the fixed deals, the player with the highest number of chips is the winner. Deals Rummy on RummyPassion.com can be played between 2 to 6 players. Usually one or more card pack is used. Each card pack consists of 52 cards plus one Joker card equalling 53 cards. As the game begins, each participating player is assigned a set number of chips with which they play. The number of deals is pre-decided. Each player gets a set number of chips with which they play. The number of deals is pre decided. At the end of each deal, the winner wins chips from all the losing players based on their score points. When the pre decided number of deals is over, the players are ranked according to their chip count. Whoever has the maximum chip count will be ranked will ranked the highest. If two or more players have the same rank, the tied players will play a tie breaker game to decide their ranks. The chips are pre-decided based on the number of deals to be played on that table. This number is based on the number of players seated at the table multiplied by the maximum score a player can get. Suppose if 6 deals are to be played, then 480 chips are allocated to every player on that table at the start of the game.